Are Disney Cruises better than Royal Caribbean? Well, I have been on 3 Royal Caribbean cruises and have loved them. So, I was interested to see how Disney compared to Royal Caribbean. We took our first Disney cruise the other day (April 18, 2013). I am going to give you my honest opinion on what I thought of the Disney Dream. Let’s start with our arrival. We arrived at the terminal and were greeted by a cast member and she asked if it was just the three of us, to which I said yes. She told me I could go down to the Concierge’s desk and check in. So we got to by-pass the regular line – Magical Moment because we were not booked in a concierge’s room. 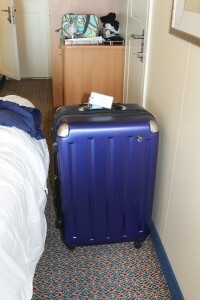 We got all checked in and boarded the ship and we had to wait about 5 minutes for our room to be ready. I walked in the room and had 2 thoughts. Wow this is nice but WOW this is a narrow room. We were booked in a Deluxe Oceanview Stateroom with Verandah. 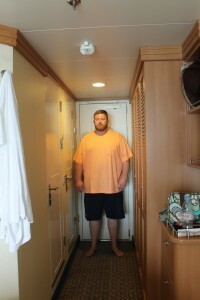 I have always stayed in a verandah room on Royal Caribbean because I am claustrophobic. I like to have some space and a way out even if it is to jump in the ocean. I have trouble sitting in a booth on the inside. I can do it if I have to. So this was one negative thing about the Disney Dream and for most it isn’t that big of a deal. The entrance is very narrow. My husband stood there and was almost shoulder to shoulder to the walls. The queen size bed is the next thing to come after that narrow entrance and it doesn’t get much wider than that. Two people could not go around the end of the bed. 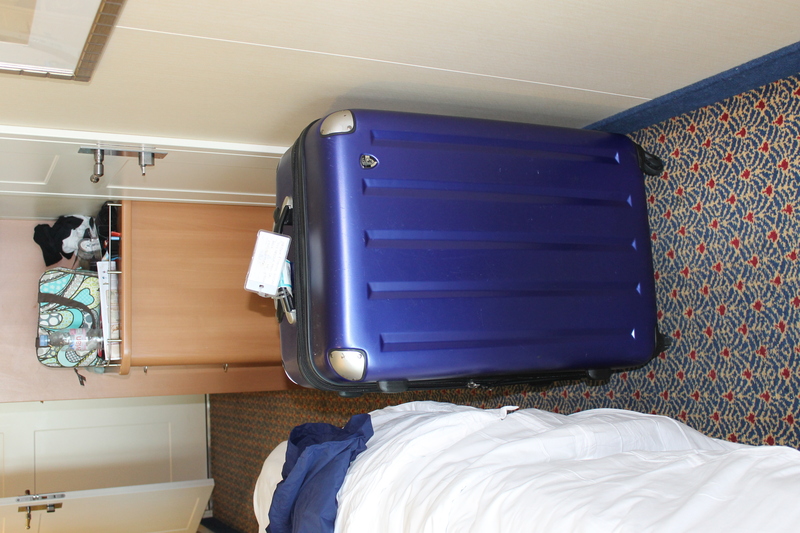 I stuck our suitcase at the end to show you how much room is left from the end of the bed to the wall. Now please do NOT TAKE THIS as a put down. This is just my opinion and remember I am claustrophobic so this sort of thing bothers me. Overall, I loved the room. I just wished it would have been a little wider. I LOVED the split bath. So very nice that I could get ready in the morning while my husband was taking a shower in the next “bathroom” without steaming up my mirror. The other thing I noticed on the Disney Dream was that the toilet did NOT stink! The last Royal Caribbean cruise we went on I almost gagged every time I went into the bathroom because the toilets smelled and it wasn’t because someone had used it. There was a good amount of counter space, closet space and drawer space. The next thing that I want to compare is the amount of things to do on the cruises. Can I just say there is so much to do on a Disney Cruise that 3 nights was not long enough to do everything! Believe it or not we never got in the pool. We never rode the AquaDuck either. That was the first thing that we were suppose to do but our son backed out after seeing that part of the tubing was dark (it goes through the smoke stack). After that we were so busy doing other things that we just didn’t get a chance to go again. There are shows on both cruise lines. Both are VERY good. Our last Royal Caribbean cruise was a 4 night cruise and by the last day I was getting bored. Now this was only a 3 night cruise but I know I would have things to do on that last day without being bored. We could have played putt putt, gone to the pool, rode the AquaDuck and much more. I am not one to sit around in the room and watch TV. I usually am doing something. Overall the food was good – there were things that were really good and others that were just o.k. You will have to watch for my blog on our dining and find out which one was my favorite. I did learn a thing or two on this cruise. I will make sure my next room is NOT an adjoining room unless I know the people next door. We had some ladies that were very loud next to us and even were ordering room service and talking at 1:30-2:00 in the morning and they were not quite. I even heard one of them snoring 2 days in a row. Other than that I never heard anyone on the other side of us. You occasionally heard a toilet flush but overall the noise level was good. We were even mid-ship right there with the stairs and the elevators. Those never bothered us. On Royal Caribbean you can get a beverage cart in your room – you pay extra for the drinks. On Disney they have soda that you can get from the pool deck for free. Bottled water did cost extra. Something else I noticed was that you can get free ice cream up on the pool deck too on the Disney cruise. My last thing that I want to compare is the our dis-embarkment. On Royal Caribbean we were assigned a time of when we were to get off the ship and it was usually later in the morning. On Disney, however, we were assigned a time when we could go to one of the restaurants and sit down for the buffet meal or go up to the Cabana at whatever time. Our time for the restaurant was 6:45 a.m. (all guests on first dining had the 6:45 a.m. time and all guests on the second dining had the 8:00 a.m. time). I would have much rather had the 8:00 time. Needless to say, we did NOT make the 6:45 time and just grabbed some finger food at the coffee bar on Deck 4. I did not like the early breakfast and the fact that EVERYONE had to be off the ship by 9:00 a.m. We had no specific time slot to get off (which was nice if you have an early flight – but we had a 2:30 flight), so it was kind of go as you please but get off by 9:00. The other thing was they started making announcements at 7:30 a.m. that the boat had been cleared and we were able to get off. They made those about every 15-20 minutes. Kind of annoying when you are hoping your child will sleep in a little (which he didn’t with all that going on). That was the only other thing that I wasn’t too keen on. Overall, I would DEFINTELY go on another cruise with Disney! I think overall it beats Royal Caribbean especially for families. 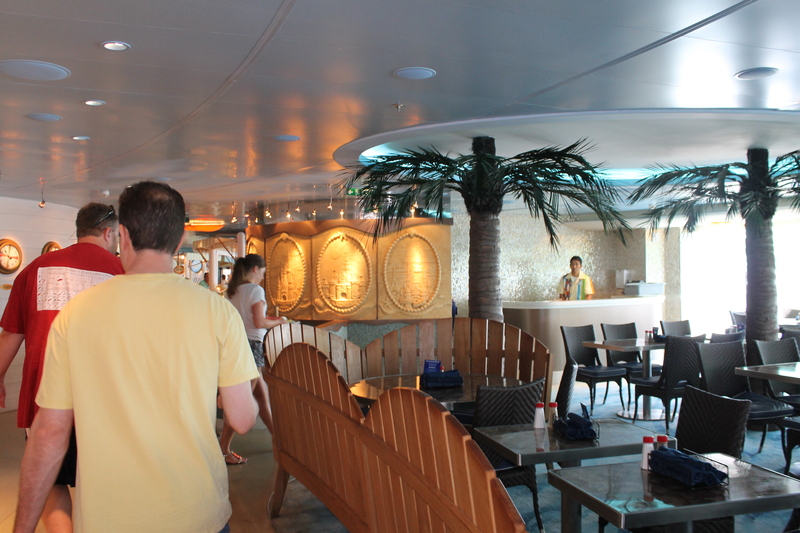 There are adult only sections of the cruise but having a child of my own I didn’t experience much of those areas. I did visit the spa. Look for my experience on that in the near future.